Manmarziyaan is a comedy-drama Indian Hindi Language movie directed by Anurag Kashyap and written by Kanika Dhillon. 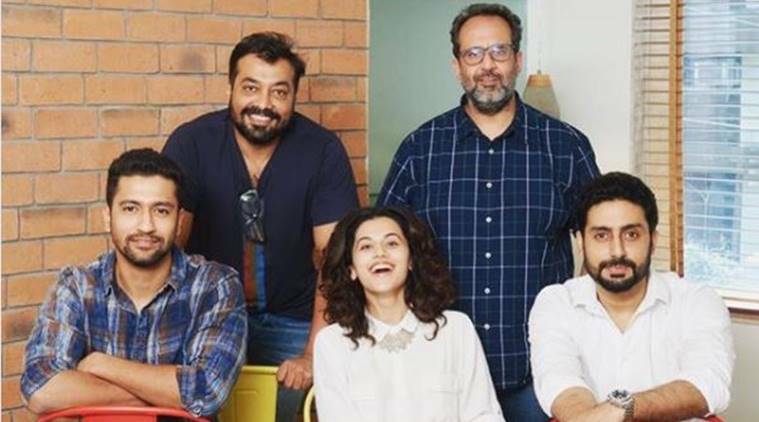 Casting Abhishek Bachchan, Taapsee Pannu, and Vicky Kaushal, the film is jointly produced by Phantom Films and Aanand L. Rai’s Colour Yellow Productions. 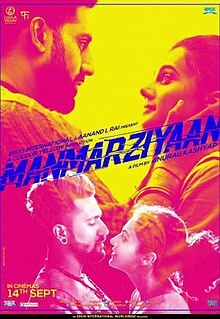 Manmarziyaan began shooting in February 2018. It is a love story which is set in Punjab, India. Principal photography of this movie wrapped up in April 2018. It premiered at the 2018 Toronto International Film Festival (TIFF) and was released in India on 14 September 2018 and this film gets the positive reviews from critics and audience alike. A trailer was released on 9 August 2018. As the movie story starts, we are introduced first which is Rumi (Taapsee Pannu) a free-spirited, young woman who is fell in love with spontaneous and equally smitten Vicky (Vicky Kaushal), a young man who is waiting for his music break and heis a part-time DJ. The young couple adores each other and can’t stay out of the bedroom. One day they are caught red-handed by Rumi’s family and pressure builds for them to get married. Strong headed and stubborn, Rumi promises her family that Vicky will come with his parents to ask for her hand in marriage and if he doesn’t show up, she will marry whomever her family wants. Her family accepts this condition. However, nervous and immature, Vicky repeatedly gets cold feet and keeps avoiding Rumi’s request to bring his parents over, causing her to be humiliated in front of her family. Eventually, she gives up on Vicky and agrees to an arranged marriage with Robbie(Abhishek Bachchan), a banker who made the love triangle. Robbie is a mature and mild natured young man, the complete opposite of Rumi’s wild and fun loving nature. He sees her photograph via the local matchmaker and explores her Facebook profile. He quickly realizes she already has a boyfriend named Vicky. And yet, he tells his mother that Rumi is the girl he wants to marry. Rumi accepts the proposal but just the night before the marriage Vicky shows up and begs her for one last chance. They argue furiously, but in the end, Rumi can’t help but still be drawn to Vicky. She agrees to elope with him. That very night Rumi shows up in front of Robbie’s house on her scooter and abruptly declares that she can’t marry him after all. Robbie is remarkably calm at her sudden statement and even helps her restart her scooter and leave for home. He then quietly reflects on what she has said and calls the local matchmaker to nudge Vicky’s parents in convincing their son that marrying Rumi would be a mistake. Vicky’s parents make him understand that he will not only destroy the relationship between Robbie and Rumi but chances are that being as irresponsible as he is, will never be able to make Rumi truly happy. Already scared of commitment, Vicky tries to shake off their warnings and drive to Rumi’s house. At the last moment, however, he reverses the car and backs off, crying all the way. A heartbroken and numb Rumi is shown waiting for Vicky one last time. Robbie and Rumi get married the next day. She is distant and aloof during their honeymoon and secretly cries for the loss of her true love. Throughout, Robbie is shown to be patient with her. When Rumi and Robbie consummate the marriage she spitefully informs Vicky via text, who in response sends her a video of himself with a new girl. Rumi who had slowly been getting comfortable with Robbie, abruptly declares she wants to go back home. Returning home she said to Vicky about all and asked him to move on. With time, Rumi grows increasingly attached to Robbie. They bond over drinking whiskey one night. Even when Vicky shows up to reveal to Robbie everything about his and Rumi’s past, Rumi tells Robbie that she wants to stay with him not Vicky. Robbie asks her if she loves him. She replies matter of factly that she will grow to love him. He smiles and reminds her that she still has a choice and that she must remember, she can tell him anything that is in her heart. Despite assuring Robbie that she wants to remain with him, Rumi ends up sleeping with Vicky when she sees him next. Utterly confused and frustrated, not knowing what she wants, she doesn’t know how she will face Robbie now. Later that night, she cries in Robbie’s arms. He’s rather confused but comforts her all the same. Everything shatters the day Robbie follows Rumi and ends up seeing her with Vicky. He overhears Vicky asking her, “Whom do you see when you make love to him?” Rumi is unable to answer this question, Robbie goes to a bar, heartbroken and ignores Rumi over the next two days. He concludes that their marriage was a sham and reminds Rumi that she had always had the choice and yet she lied to him and went behind his back. Robbie confesses that he loved Rumi through everything but she and Vicky deserve each other. The next day, Robbie apologizes to Rumi for his outburst but also files for an annulment. Rumi starts missing Robbie’s presence despite now having Vicky back. Vicky finally comes to her house with his parents and talks about their future together. Rumi hearing this news runs back to her house just to catch a glimpse of him but finds him gone by the time she reaches. Rumi realizes that she was in love with Robbie and that the love she had had for Vicky hadn’t ever had the same depth. The day of her annulment, Rumi tells Vicky that they had been a great couple without being married but she didn’t think they could be as great after marriage. She says that she had been lucky that he was her first love but she knew in her heart that he wasn’t ready for marriage after all and asks him to let her go. Initially reluctant, Vicky eventually bids Rumi an emotional goodbye. Rumi meets Robbie in court. They both sign the papers despite hesitation on both ends. Robbie offers to walk Rumi back home. On the way, Rumi tells him that because her parents had died when she was very young, her whole family had spoilt her. She answers all the unanswered questions Robbie asked her before. Robbie tells her that despite knowing everything about her past when he saw her picture, he really liked her. He mentions how he still does. Reaching their destination, they bid their goodbyes. Rumi asks him if he was still on Facebook or blocked her. Robbie smiles and asks her to send a friend request and he will accept. Rumi sends him a friend request that instant and waits for his response. While walking back home, Robbie takes out his phone, opens her profile and sees that she has moved on from the “Vicky Phase” and changed her profile picture to one of her wedding photos. Seeing this, Robbie opens his arms and Rumi runs into them. She is finally at peace with her decision and knows where her heart truly lies. In November 2016, it was revealed that Anurag Kashyap will be directing Manmarziyaan, produced by Aanand L. Rai. Previously, it was supposed to be directed by Sameer Sharma, who had shot some portions of the movie, but Aanand L.Rai was not happy with the rough portions and he stopped the shooting. Then he approached Ashwiny Iyer Tiwari to direct it, but she could not do it because of her “prior commitments” reason. Initially, it was reported by the media members that Dulquer Salmaan, Ayushmann Khurrana, and Bhumi Pednekar were casting in the film, but they dropped out of the film. Abhishek Bachchan was then be placed in as a replacement for Dulquer Salmaan. Tapase Pannu’s character in the film is a sports shop owner who has learned hockey from her Family. In December 2017, it was revealed that Abhishek Bachchan will be a part of this movie. The main casting also features Masaan star, Vicky Kaushal, who plays an aspiring DJ man but he is unable to commit to his love. The film has been shot in Punjab India, while some portions have been shot in Delhi and Jammu & Kashmir. Manmarziyaan had a positive weekend at the Box Office as it managed to gain Rs. 14 crore. The film saw a further jump in collections on Sunday as a result of which Rs. 5.70 crore more came in by this movie. The movie had the collections been closer to the Rs. 20 crore mark, it would have been even better than this, more so since there was a good effort from Anurag Kashyap, Aanand L. Rai, and Eros film production.